It is always sad to kill when you do not want to eat what you kill. 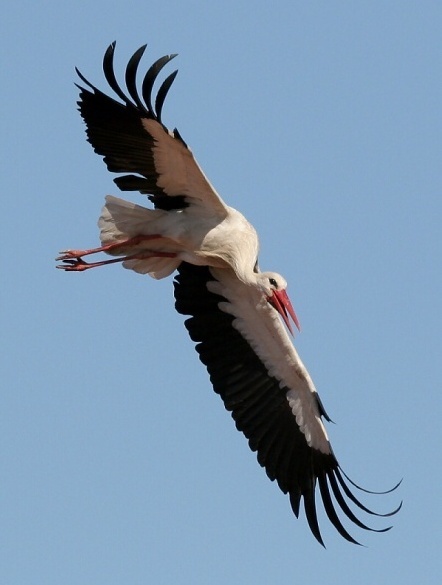 A while ago I was out in the bush and came across a white stork like the one above. It was trapped in a thicket of thorns. On closer inspection it became clear that a wing and a leg were very badly broken. Whether this was the case before he/she became entangled (before Lisa came along I had no 'he/she' issues....) we could not determine. However the bird had to be put out of its misery and I was called upon to do so. It is strange that a man who has killed so many things can be so reluctant to kill. I did it as quick and painless as I could. I kept a bedraggled wing feather as a reminder but have since lost that. We left the body for the jackal’s and such. If was most probably because of her massive beak that she was still alive when we found her.